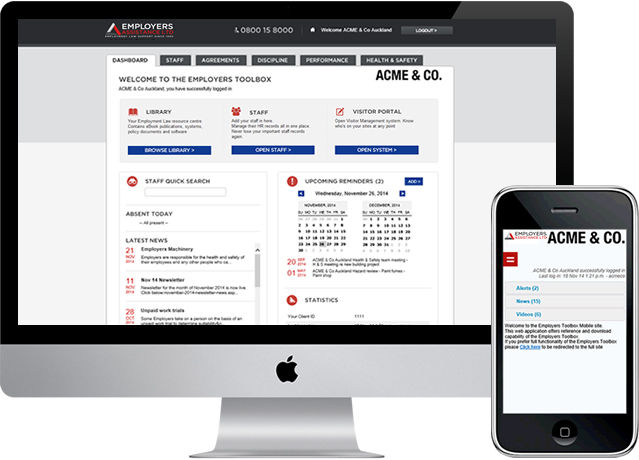 www.EmployersToolbox.co.nz is our interactive online system of HR, Employment Law and Health & Safety resources. Access to this facility is on a monthly subscription basis with a minimum term of 12 months. Businesses get an account with their own secure logins, create, develop and store their own customised Agreements, forms, policies and systems, download and use them. All work is stored in your account in the cloud with no limit on storage space. 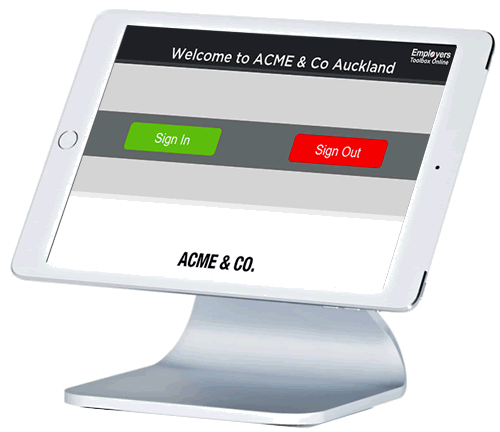 Employment Agreements can also be signed electronically by both parties using our eSigning system integrated with the Toolbox. No unnecessary delays, unauthorised changes or lost documents again. 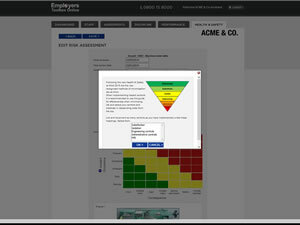 A comprehensive staff management module is central to the generation, implementation and delivery of important HR documents such as Employment Agreements, performance appraisals and disciplinary processes. Upload your own HR documents for centralised storage and 24x7 access to complete your comprehensive and secure online HR solution. The systems on the web are 100% up to date on the day of the visit or download. Changes by legislation or the courts are included. Our in house legal team modify the templates as and when required to keep up to date with best practices as case law changes. You can enter the site at your convenience from any computer with web access. You do not have to wait for a CD or install the contents - instant solutions. Never lose your mission critical files again. This is an enterprise wide solution - permission level logins, multi-site, multi-user access. The Dashboard is the default page. Upon login the user is presented with a brief synopsis of their status. Staff database search, quick statistics, important news updates and alerts all appear here. 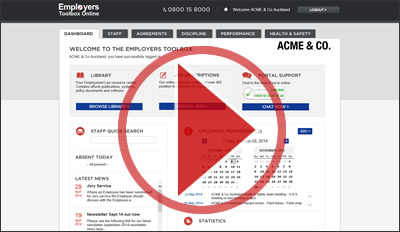 Access to the Employment Law Library, staff files and Visitor Portal is here also. Live support chat is available if we're online too. Users change their preferences from here. Passwords, staff leave management and even upload your company logo to customise your Toolbox. The software being cloud based means our legal team update the content as and when legislation, case law or best practices change at no cost or downtime to users. Discipline and dismissals can be the easiest part to get wrong for the Employer. It's not all about justification - it's more about process. Get any procedural part wrong and you will probably lose in the case of a dispute. Performance Appraisals encourage open dialogue away from the day to day pressures of the job and facilitates both parties finding and correcting any issues before they develop into problems. There is also a framework for Performance Improvement Programmes. Addressing performance issues or upskilling staff can all be managed in a procedurally fair way here. Previously known as 'OSH online', our Health & Safety module provides a management framework to monitor and maintain a company's health and safety compliance issues. Or join online now and get to work instantly.